Family Day is right around the corner and is, of course, all about spending time with loved ones and taking advantage of the long weekend. What better way to do that then to take a quick mini-vacation! Here's a look at the top five most popular domestic destinations over the holiday weekend, along with some fantastic things to do in each city. Family Day is right around the corner and is, of course, all about spending time with loved ones and taking advantage of the long weekend. What better way to do that then to take a quick mini-vacation! I checked our most popular domestic destinations for the coming Family Day weekend and wasn't surprised to see that many Canadians are planning to travel to popular nearby destinations. With prices around $75/night, it's the perfect time to head to the city and spend the weekend concentrating on one thing--spending time with loved ones. No chores, no appointments, just family. Here's a look at the top five most popular domestic destinations over the holiday weekend, along with some fantastic things to do in each city. As the country's largest city, it's no surprise that Toronto is the most popular destinations for this three-day weekend. The city offers a wide variety of affordable activities the whole family can enjoy together and is a great place to spend the long weekend. The weekend-long Family Fun Fest in Downsview Park is the perfect place to entertain those of all ages with more than 30 rides, activities and attractions including jumping castles, giant slides and carnival games. Also, over the short holiday many families choose to travel with their pets -- Family Day at Purina PawsAway Winter Funderland on the waterfront is a great place to bring your four-legged friends. I'm a huge fan of skiing with my family! Montreal offers some of the best snow sports in Canada. Grab your skis, snowboard, or sled and head to one of Montreal's magical ski resorts. If you're looking to escape the cold, the Montreal Museum of Fine Arts is the perfect way to warm up while taking in the arts. Ottawa is another great place to celebrate the last of winter sports during this three-day weekend. Fishing is a great family activity and spending the day on the ice with Ottawa River Guided Fishing is even more rewarding when you enjoy a lunch of fresh fish you caught yourself! After a day on ice hot chocolate and freshly baked treats are a great way to warm up after a long day of outdoor activities with the family. I'm a fan of adult spiked hot cocoa and a movie by the fire to end the day. 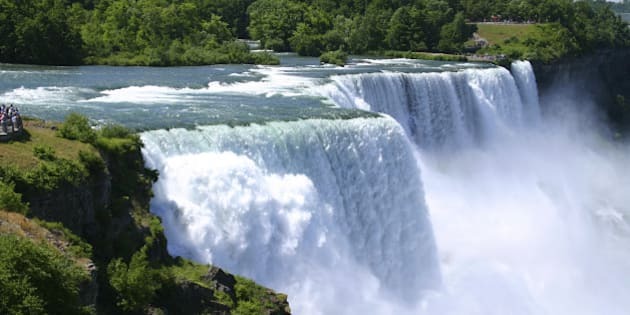 Niagara Falls is obviously known for its beautiful waterfalls but also offers many fun options for locals and travellers alike and some big hotel savings. With a climate controlled Ferris wheels, indoor waterparks, butterfly conservatories and Family Fun Day at the Niagara Falls History Museum you'll soon forget that it's the middle of winter. Don't forget to check out Winterfest 2015, where the kids can learn wilderness skills and make crafts while enjoying a hotdog by the campfire. Halifax is arguably one of the snowiest destinations on this top five list, but you can take advantage of great savings in this winter wonderland. The city offers sleigh rides for the whole family at Hatfield Farms, and visitors can warm up at Neptune Theater, which offers a mix of new hits and adored classics that attract up to 80,000 visitors a year. *Average prices mentioned above are based on hotel bookings made on Hotwire.com on January 28, 2015 for travel between 2/14-2/16/15.